Navigation: To start, click a Category on the left to view all the produts for sale within that category. You can also click products at the top, then select a Category. To navigate from page-to-page within a category, click on next page or previous page located at the bottom right of the page. While shopping, any items you select are always visible in your shopping cart, on the right. Instructions: You can shop, change a quantity ordered, recalculate your order, remove items from your cart, continue shopping and then proceed to check out. When you checkout, you will be asked to create a user profile with your billing address, a password and your email address. Be sure that all information, including your email address, is correct after typing it. Add'l Information: Ensure you read our Shipping & Returns Policy, Conditions of Use, and Privacy statement before ordering. Also, there are times when a product was shown, but no longer appears in the store - that may be due to reaching its low limit and we are reordering, or the item is no longer available. Any questions, click "Contact Us" above. Security: For security purposes, your IP Address: (3.91.157.213) has been recorded. Credit card payments are encrypted between you and the Authorize Net payment processing gateway using a High Security SSL Certificate. NO credit card information is retained on our server. Any problems ordering, email the Webmaster by clicking HERE. Thank you for shopping at The Packard Club. 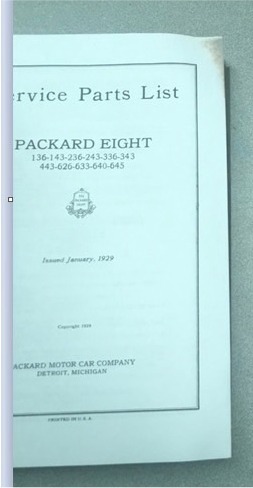 All Text & Contents of this Shopping Cart, unless otherwise noted, are © Copyright by The Packard® Club, All rights reserved worldwide. Copyright © 2019 Packard Club Store.